The Aeronautical Development Agency was created to manage the LCA (Light Combat Aircraft) initiative. Its main partner was Hindustan Aeronautics Limited (HAL), which had developed India’s first jet aircraft, the HF-24 Marut, in the 1960s. Unfortunately, Indian aeronautic development was hampered by political pressure because of its nuclear tests at Pokhran. By 1989, Indian infrastructure, facilities, and technology were judged advanced enough to undertake the project. 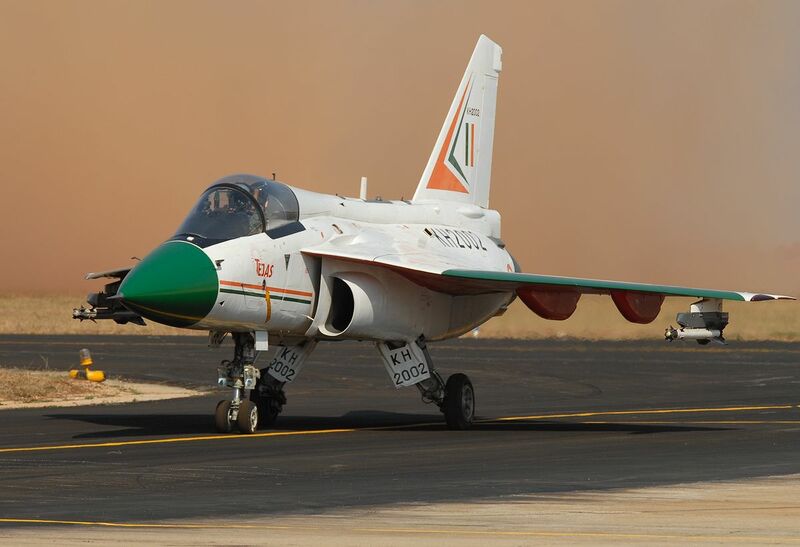 The first prototype flew in January 2001, piloted by Wing Commander Rajiv Kothiyal. By 2005, 20 production series aircraft were ordered, and again in 2010. However, production only began in 2013, the aircraft being introduced in the air force in January 2015. The Tejas is designed in two main variants: one for the air force, and one for the navy. Together, both agencies’ requirements represent about 160 aircraft. It has also been reported that “India would also consider selling the planes to other friendly countries,” but only after its being introduced into India’s own air force. Sri Lanka and Egypt have expressed interest. The Tejas is designed in a tailless compound delta wing, and is conceived for relaxed static stability in flight, enhancing maneuverability. The tailless design increases payload capacity and confers better flight characteristics. The Tejas is composed of 45% carbon-fibre composites by weight, reducing the aircraft’s weight by 21%, removing 40% of the necessary parts, avoiding approximately 2 000 drilled holes, and shortening the manufacturing process by four months. Although the Tejas’ primary purpose is air superiority, it is also a multirole fighter and includes ground attack and anti-ship capabilities. It can has seven main hardpoints for bombs, anti-ship missiles, air-to-surface missiles, air-to-air missiles (Astra, Derby, Python-5, R-77, R-73), as well as an eight hardpoint for pods, plus a gun. It is electronically assisted by a quadruplex digital fly-by-wire flight control system, and has an on-board oxygen-generating system and aerial refuelling probe for extended flights. The Tejas also features certain stealth characteristics such as radar-absorbent coating, a Y-shaped inlet, and the use of radar nonreflective composites. The navy variant includes a reinforced airframe, a powered nose wheel steering, leading edge vortex controllers, and a drooped nose for better vision. It is designed for ski-jump take-off from aircraft carriers. Only three Tejas systems are of foreign design&colon; the multi-function displays by Sextant (France) and Elbit (Israel), the helmet-mounted display and sight cueing system by Elbit (Israel), and the laser pod by Rafael (Israel). Unless otherwise mentioned, this webpage and its content is licensed under the Attribution 4.0 International license. You may quote and copy this material if you give correct credit to the author and do not distort or otherwise change the original meaning of his words. Copying any material on this website without giving correct credit to the author is both plagiarism and copyright infringment, and will be treated as such. Denis G. Labrecque published this document on June 27, 2016. It was last modified on June 28, 2016. Proudly hosted on GitHub using Jekyll markdown.